Atlantic Lab Equipment’s dynamic product mix, with added expertise in liquid handling, is able to provide premium lab automation solutions for a variety of life science applications. ALE’s applications team has developed both stand-alone and fully integrated solutions in industry, government, and academia. ALE’s service and applications team can develop complete lab automation solutions for our customers. This involves method development and/or programming on the liquid handling system as well as integration of peripheral devices. We can work with equipment from a wide range of manufacturers, with Tecan, Beckman, and Agilent the most popular. We also have the capability of developing and implementing other automation-friendly devices to the Tecan platform if desired, thus improving the process flow and throughput in your lab. Our SLAS-2016 application station, where we exhibit one of our integrated systems for the Tecan Liquid Handler. This configuration utilizes a Velocity11 plate centrifuge, Tecan plate reader, and Robotic Manipulator arm. Installation of an Air LiHa Robotic Arm on a Tecan EVO system. These arms use air displacement to provide high-precision pipetting, making the use of system liquids unnecessary. ALE is able to provide the installation and training of Tecan systems per the manufacturer’s documentation. Typically, three days are itemized with the sale of an automated solution enabling a template method developed for the customer along with training. We are also able to customize the training based on the requirements in the lab. Our trained team of engineers have considerable experience training lab technicians and scientists. Having considerable experience with Tecan automation, ALE is capable of providing application development services to our customers who desire it. Our trained staff’s objective is to provide quality templates in a timely manner, thus reducing the time to first result for the lab. Our engineering team works both remotely and on-site to resolve hardware and software-related issues while also offering full service contracts and Preventive Maintenance (PM) agreements for the Tecan solutions. With staff located throughout the US, our responses are timely, thus down time with our instruments is very low. 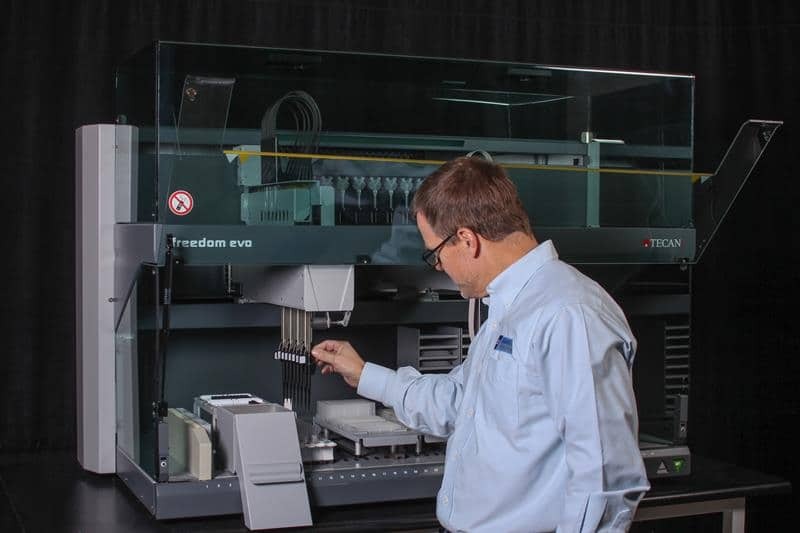 Installation of a Tecan EVO Colony Picker Solution, which is set up for colony picking, gene assembly & transformations, extractions, and PCR setup.